If you're a thrill seeker and want to see the greatest light show on earth, take a late-summer vacation to southern Nevada. The show is performed almost every afternoon, is never cancelled by rain, and the admission is free! A Las Vegas pyrotechnic extravaganza, you ask? No! That's much too tame. We're talkin' Mother Nature. She's the producer, the director, the lighting technician, and the sound supervisor, all rolled into one big anvil cloud. Zeus is the star, and his script is unrehearsed. The hot dusty desert is the stage, and the show goes on whether there's an audience or not. I speak from experience. When I was ten we moved from Santa Barbara, CA to Boulder City, NV (a small town 20 mi. south of Las Vegas) mainly because my dad was skinny (always cold) and liked extreme heat. As an artist, he found stark beauty in the desert's lunar landscape with sagebrush and in its unusual cloud formations. All I remember of the 4 years we baked there was the searing 120 degree temperatures, the terrifyingly spectacular thunder and lightning storms, and the resulting flash floods that overflowed the street gutters with warm gushing rivers to swim in. That was great fun! But then the sun would come out and dry everything up in a few hours, like water drops on a hot griddle, as if it had never happened. 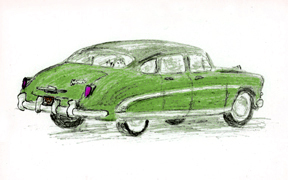 For a family outing, my dad would load all eight of us into the old Hudson Hornet and speed off (0-50 in 15 minutes) to be right in the middle of harm's way. We'd sit squeezed together, quivering with excitement (believing we were safe in our rubber-tired capsule) while the rain beat down so loud it rivaled the thunder. We'd gasp in unison, "OOOOOOO did you see THAT? ", every time lightning flashed, then giggle like crazy. We didn't know it back in the 1950's, but now they have a name for people like that (storm chasers) and laws called child endangerment. We were just trying to have a little family fun! I still love a good storm, but now that I've grown older and wiser and boringly safety-oriented, I decided to put lightning rods on my house. The chances of getting hit by lightning depend on location, location, location, so my house, sitting on top of a hill, had me worried. It had already burned down once, so I figured the nominal cost of a lightning protection system would be money well spent. Lightning is a spark of static electricity on a gigantic scale, and thunder is the shock wave of expanding air created by that spark. Light travels a million times faster than sound, hence the delay after the flash. If the strike is a mile away, it'll take 5 seconds before you hear the thunder. Lightning is formed when raindrops and hailstones, and dust and heat, are all roiling around violently inside a thundercloud (cumulonimbus). Internal winds can reach 125 mph! That's a lot of bumping and grinding! The negatively charged cloud particles coax the positively charged earth particles to "Come on up; I'll meet you halfway." Opposites attract, they race toward each other, they kiss, the sparks fly, and the relationship is over in a split second. Sound like Hollywood? Nope. It's Mother Nature again! A bolt of lightning can produce from 100 million to 1 billion volts, and deliver between 1000 and 300,000 amps, and reach temperatures of 50,000 degrees Fahrenheit! Those figures are beyond my comprehension, but what really boggles the mind is that people can survive being hit by such a jolt. Every year in the US an average of 200 people are killed, but another 750 are only injured by lightning. One man in Virginia got hit by lightning seven times between 1942 and 1977! Unfortunately, his lucky streak didn't apply to the lottery...probably because his chances of getting hit by lightning were 1 in 700,000, and his odds of winning the lottery were one in several million. I would call him the luckiest unlucky man in the world! Lightning is like most things in life: it will take the path of least resistance and the shortest distance between two points. But unlike a tornado looking for a trailer park, lightning is a little more predictable and controllable. Nevertheless, it has its quirks. Even scientists will admit they can't explain some of its erratic behavior. There is forked lightning (our biggest concern here), streak lightning (more direct than forked), sheet lightning (jumps cloud to cloud), high-altitude lightning (weird), ball lightning (totally weird), bead lightning (unexplainable), and St. Elmo's Fire (a creepy glow). When the clouds aren't fighting among themselves, they like to socialize by hovering over populated areas where they can play with us. Lightning strikes the highest buildings and trees because tall projecting objects provide an easier path to ground than air is. (Air is an insulator; not a good conductor of electricity.) There are approximately 100,000 thunderstorms across the US each year, causing 10,000 forest fires and billions of dollars in property damage to homes and other structures. Globally, there are 100 lightning strikes per second, equaling 8,640,000 times per day! That's reason enough to consider a lightning protection system on your house, especially if you're in a vulnerable area. A lightning rod's positive charge actually rushes upward at 60,000 miles per second to meet the negative charge. A leading expert on lightning wrote that the stepped leader (a fork in the zig-zag) is unaware of the lightning rod until it is about 150 feet above it. That's when a spark from the tip of the rod jumps up and closes the circuit. The resulting flash happens within 1/5000 of a second upon contact. All the experts assure us that a lightning rod does not attract lightning; it's simply there to dissipate the charge if it does strike. But if the conducive conditions are only 150' above your house, it probably is going to strike! 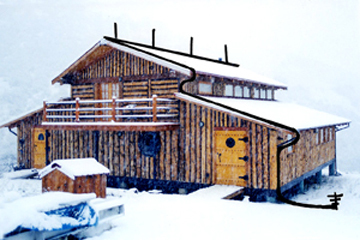 The system on your roof provides a designated path for the current to travel down and into the ground. The general consensus among scientists is that rods improve your chances of diverting a hit, but there is no absolute guarantee of total protection. Lightning doesn't always follow the rules. If you receive a huge direct hit, they say all bets are off. Knowing that, I still think it's cheap insurance, especially if you do the labor yourself, as I did. Right or wrong, I have the peace of mind of knowing that at least the odds are in my favor now. And, if I'm wrong I'll never know what hit me! I shopped around on the internet for a supplier and chose Automatic Lightning in Wausau, Wisconsin to order from. 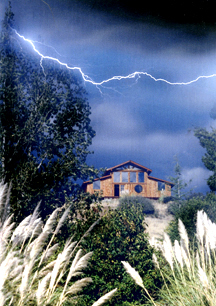 (www.lightningrod.com, 1-800-532-0990). Dana was very helpful in designing and customizing my system. I sent him a photo of the house, he superimposed the system on it with an illustration and sent instructions along with my order. He was almost always right there to answer when I called with questions; if I left a message, he called back ASAP. I like doing business with people who follow up after the sale. All the materials he sold me are Underwriters Laboratories (UL) approved. I bought everything mail-order except for the ground-rods (they are 8'-long and heavy to ship), ground-rod clamps, polyurethane caulk, plumber's tape, and small odds and ends. All these items were quite a bit cheaper at the hardware store. The entire system was $400... not too bad for a for a lifetime of protection. Rods (air terminals) placed every 20' or less along the roof ridge. 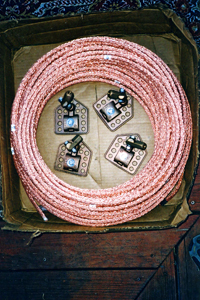 Main conductor (down cable)...a heavy duty braided copper cable containing 32 strands of #17 wire. Secondary conductor cables (branching off from main cable to stovepipes, etc., to prevent side-flashing (jumping off track) of lightning on the way down. Lightning arrester (surge protector) installed in the house's electrical panel to divert surges into the ground rod. Ground rods (copper-clad iron rods 1/2" dia. by 8' long driven into the earth to guide the lightning harmlessly into the ground). 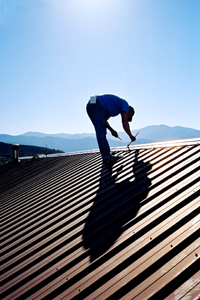 All materials in the system must be corrosion-resistant. If you choose copper or aluminum, stick with your choice. Dissimilar metals in contact with each other plus moisture will corrode and eventually fail. Any weak link in the chain will compromise the integrity of the whole system. This list is for the standard lightning protection I used. Your system may have different requirements and need additional materials. 200 ft. Copper conductor cable @$1.09/ft. (reasonable from internet supplier, but twice that price from the local hardware store because they don't stock it in volume) The footage depends on the house size. 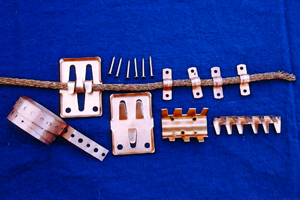 40 Copper cable clips (adhesive style) to secure cable to metal roof every 3'. 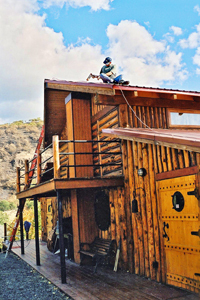 They are glued on the roof with polyurethane caulk. 1 Bonding lug to fasten cable to stovepipe (bronze or copper) after drilling small hole in stovepipe. 4 Bronze swivel-mounts with 4 screw-in 12" copper rods (the air terminals). Mounts have adhesive base to be attached to roof with polyurethane caulk. 2 Copper-clad grounding rods...one for each end of the house on diagonally opposite corners. 3 Ground-rod clamps to tightly connect cable to ground-rod. 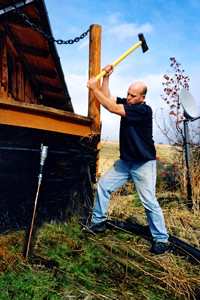 The third one is to connect the house's original ground-rod to the lightning system's ground-rod via the braided cable. Bronze or copper acorn-style clamps work well. Whole-House Protecto (surge protector) installed in electrical panel in house, connected by heavy wire to the panel's ground-rod, to dissipate possible surges into the ground. 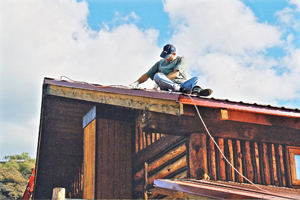 Several 1/2" copper U-shaped pipe brackets and small copper nails to attach the cable to the wood beams and logs, on its route down from the roof. I used plastic straps to attach the cable to the rain gutters. Installation was very straightforward. First I glued all four swivel-based rod brackets in their places just down from the ridge, about 20' apart, starting not more than 2' from the edge of the roof, as instructions dictated. 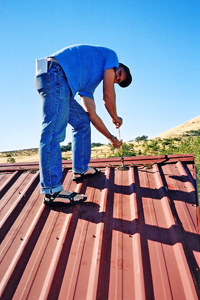 I could have chosen brackets that straddled the apex of the ridge, but I didn't want to drill holes in my metal roof. While up there I also glued on all the copper cable crimpers (3' apart) that would hold the wire in place as it runs along the roof. My son and I then worked together unrolling the heavy wire up from the ground, along its designated path on the ridge, and down the other side to the ground again. We adjusted it just right so equal amounts were hanging down from each end (waiting to be fastened to the ground rods). The cable was slippery, so we temporarily secured it here and there on the roof with duck tape while we made our adjustments. Then, moving along the ridge, we guided the cable onto the crimper brackets, pushed the tabs down to permanently secure the cable in place, and at the same time secured the cable to the four lightning rod brackets as they came along in the path. Eric secured the short cable that teed off from the main cable over to the stovepipe, with the bonding lug and plumber's tape. Then I let him do the fun job of screwing the four air-terminals into their brackets. He adjusted them to point straight up and tightened the nuts with a wrench. Then we got off the roof and both went whew! in relief, at being on level ground again! He went on his merry way, and I climbed the ladder again to continue snaking the wire down, down, down....along each end of each roof (north and south), around the 2' overhangs on the eves (no tight bends allowed in the cable! ), and down the rain gutters, through the decks (via small drilled holes), and over to the ground-rods driven 8' into the earth (one on each end of the house). 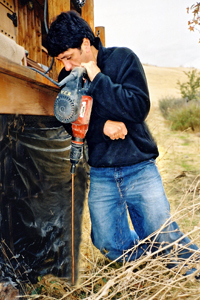 To drive them into my rock-hard soil, I rented a ground-rod jackhammer from the local rental shop ($20 for 2 hrs.) and that remarkable tool worked great! I crawled under the house and attached a cut length of the braided cable to the house's existing ground rod, then connected the other end to the lightning protection system's ground rod. That activated the whole-house protector I had already installed in the electrical panel. The protector comes with easy instructions...but don't forget to turn the power off first! It would be ironic to get electrocuted while installing a lightning protection system! But then there's the old saying: "Tragedy plus time equals comedy". Future relatives would have some good laughs telling the story about what happened to grandma back in 2004. There are a few more things to know about lightning: It's extreme heat can cause fires (duh), but not if it stays on course through the thick, multi-stranded wire. There isn't time for it to catch the roof on fire in 1/5000 of a second. However, lightning can jump around if it can find an easier path to ground. It's not uncommon for these side flashes to occur even if you have a protection system. If you are on the phone, a side flash may find you more attractive (pun intended) than a plain 'ol skinny wire, because you are 66 percent water...full of electrolytes...and you're holding a wire to your ear! The best and cheapest way to protect all of the electronic equipment in the house is to unplug it during a storm. Even a full-fledged lightning-protection system will not guarantee against damage to stereos, TVs, appliances, computers, telephones, and antennas, especially if you get a direct hit. Incidentally, cars are relatively safe if you put your hands in your lap and don't touch anything metal. This article is simply a primer on lightning and an account of my own experience in installing a protection system on my particular house. I don't claim to be an expert, and have acquired only the knowledge it took to do a satisfactory job on my own house...not enough to advise others exactly how to do their projects. But the information is readily available if you get on the web and do your own research. What I can say, now that my job is done, is that visually the protection system is barely noticeable on the house, it was not a difficult project, and the installation is quite do-able for any adept do-it-yourselfer. I'm confident that the system will do what it's supposed to do if the time comes, so lightning is one less danger I have to worry about. But now there's another one! I've been watching the science channel on TV lately, and almost every astronomy program warns us that distant objects and flying debris, hurtling through space, are headed our way. Yikes! I think my next big purchase will be a meteor helmet!